As the years go by your full-size stroller can become the source of many gripes. While it served its purpose by carrying a car seat, tackling terrain and supporting your infant through the first few years of life, it eventually gets to be too big and bulky for everyday use with your growing toddler. Enter the umbrella stroller: a lightweight stroller that is compact when folded and perfect for errands or for travel. We considered 22 different umbrella strollers, eventually narrowing it down to five for real world testing. After our 27 hours of research and testing, the Maclaren Triumph came out on top. It’s lightweight, easy to fold, has a supportive seat and comes with an industry-leading lifetime warranty on the frame. On top of that, the entire Maclaren lineup just received an update for 2016. The Triumph now has a larger canopy with UV protection, a revised suspension and improved seat design. Parents who want a lightweight stroller for errands, small spaces, or for traveling. An umbrella stroller typically weighs between 7 and 15 pounds, which is much lighter than your everyday full-size strolling options. They’re also great for anyone looking for something easy to fold, and that’s less bulky in the car. What Makes A Good Umbrella Stroller? An umbrella stroller was originally a type of stroller that folded and unfolded in a way that resembled an umbrella, and that had handles that resembled the “J-shape” of an umbrella hook. 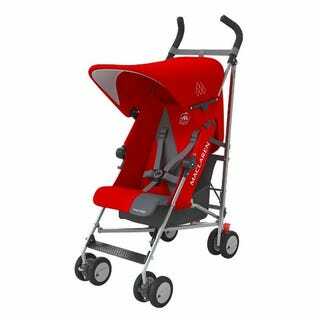 The term has since come to categorize the entire brood of lightweight, compact and easy-to-fold strollers. Seeing as there are hundreds of options, how does one choose the one that’s best for them? When we talked to our in-person testers, the weight of the stroller was the single most important factor to consider in their decision-making process. We feel that you should stay within the 7 to 12 pound range if you want a stroller that will be significantly lighter than your full-size stroller, otherwise, you might as well keep using your full-sizer. Another key factor is how small the stroller folds. You’ll want an umbrella stroller that folds as flat as possible and locks itself into place reliably without fuss. Other important features were basket storage and handle height. You’ll never has as much storage onboard your umbrella stroller as you will on a full-size, but you should be able to tote along the basics, and even keep a lightweight bag hooked onto the handles, so long as it doesn’t tip the stroller backwards or make it unstable. Lastly, having the option to recline the seat for a toddler that tends to doze off on long walks is a must-have for almost every parent we talked to. We did test strollers that did not have a recline, but would recommend them only for older toddlers, or for parents who need the lightest possible solution for transporting their kids, as they tend to be lighter than their reclining counterparts. We started by talking with parents, reading every blog post and online review we could find, as well perusing Amazon to gather information on what parents wanted in their umbrella stroller. After that we narrowed down our candidates to a list of five strollers that we chose to test in the real world. We then asked three sets of parents to join us for multiple days of testing that put our candidates through the wringer: daily errands, trips to the park on mixed terrain, and lots of folding and unfolding. Our parents brought their kids with, ranging in age from 7 months up to 5 years old to give us a good idea of how a wide range of babies and toddlers would fit into the stroller. After our tests concluded, the clear winner was the Maclaren Triumph. The triumph combines a deep recline for napping as well as a lightweight design, at just over 11 pounds. Firm handles that are made of foam are comfortable and stood up well to daily use, even when one of testers dragged the stroller through the parking lot in the rain. Speaking of rain, the Triumph’s hood is waterproof, and the stroller even comes with a raincover. Our 7-month-old tester fit comfortably into the seat, with plenty of room to grow. The 5-year-old tester also fit, and had approximately 3 inches of room before his head hit the top of the canopy. We took notice of the Triumph’s (as well as the rest of the Maclaren lineup) dual-action buckle system. This means that you have to press both the front side as well as the back side of the buckle simultaneously to undo the harness. This feature received high praise from the parents, as their kids had no clue as to how to unbuckle themselves. Our pick did fine on paved trails and sidewalks, but as expected didn’t perform as well as our Best Stroller selection on grass, rocky paths or dirt. In the end, you won’t expect the same level of performance from an umbrella stroller as compared to a jogger or full-size stroller. You’re trading that smooth ride and the big wheels for something that’s both lighter and easier to lug around. Another selling point for the Triumph is just how durable the product is. Once we started testing, we started seeing other Maclaren strollers everywhere we went. What was most interesting was that we not only saw new ones, but spotted some that had been purchased many, many years ago (as evidenced by their faded colors or discontinued patterns) that were still in excellent working condition. Maclaren backs up their entire lineup with what they’ve dubbed a Sovereign Lifetime Warranty. In a nutshell, this provides complimentary fixing of any problem that occurs due to manufacturing defects during the entire time you use your stroller. We called their customer service line to test out how responsive they were, and were greeted almost immediately with a helpful (and vaguely British sounding) customer service specialist. While it’s not the cheapest stroller on the market, it certainly isn’t the most expensive, and offers a lot of features for the price. These include: a waterproof hood, dual-action buckle, reclining seat, and ergonomic foam handles. As with most baby products, there’s always a step up. A product with more features that also carries a higher price tag. If you want a more-padded seat, articulating footrest and a larger canopy, than look no further than the all-new redesigned UPPAbaby G-Luxe. The seat pad on the G-Luxe is removable, and machine-washable. It velcros on to the existing fabric, and provides a thick, and supportive seat for babies as young as three months old. The fold can be done using only your hands, which is great for traveling parents in flip flops. The downside is the weight. This year’s G-Luxe weighs in at 15 lbs, significantly heavier than last year’s model and claims the dubious spot as the heaviest umbrella stroller that we tested. All of this comes with a price tag of $259, or $279 for the upgraded black frame option. If either of the previous picks are out of your budget, than the Summer Infant 3D Lite Convenience Stroller is a great option for only $80. The seat reclines to an excellent near-flat position, but the recline buttons are flimsy and feel like they’re a part of an old poolside chaise lounge. That said, it has tall handles, weighs 12 pound, and of course, the price is great. We considered these alternatives from manufacturers, but can’t recommend them. Baby Cargo 300 Series—A very heavy stroller weighing in at 17.4 pounds. Baby Jogger Vue Lite —A great concept, but the execution of the reversible seat is awkward, with velcro patches holding it together. There’s also no basket to speak of. Bumbleride Flite—Short and narrow seat doesn’t fit taller toddlers, and the adapter must be removed prior to folding. Chicco Echo—Doesn’t recline as much as the competition. The ride was bumpy and the stroller had a small seat. GB Baby Zuzu—Gets points for having a true “umbrella-fold” but it’s still heavy at 15 pounds, and has short handles. Graco Breaze—Weighs 18 pounds. The locking mechanism doesn’t keep the stroller closed, and the leg-rest is too close to the footrest, making it hard for toddlers to keep their feet from touching the ground. Inglesina Net—Brand New design. We’ll keep an eye on the reviews to see if it holds up, but it’s too early to offer a recommendation. Maclaren Mark II—The lightest premium stroller available at only 7.4 pounds. That said, it doesn’t recline and didn’t push nearly as well given its small diameter wheels. A solid pick however for older kids who don’t need a reclining seat. Maclaren Quest Sport—Full, infant capable recline which is great, but we feel that most parents looking for an umbrella stroller have babies that are already 6 months old anyways. Our pick is 3 pounds lighter and more compact when folded. Peg Perego Pliko Mini—This one had a tiny seat that reviewers said didn’t fit taller babies. UPPAbaby G Lite—No recline, and expensive given that it has a limited feature set. It’s also heavier than other non-reclining options. If you’re dealing with a squeaky set of wheels, Maclaren recommends using a silicone based lubricant instead of oil, as the oil can attract more dust and small rock particles. The seat fabric can be machine washed in cold water, but avoid putting the harness or hood in with it. These can be sponge cleaned by hand with a mild detergent. As we mentioned before, the Maclaren Triumph comes with a Sovereign Lifetime Warranty. This provides complimentary repairs on anything related to a manufacturer defect. This covers your stroller for the entire period of time that you use it, whether it’s six months or six years. Note though that this is only extended to customers who register their strollers, and it’s only good for the original owner. In addition, the company has set up authorized service centers to provide nearby, low-cost repairs for damaged buggies, something that no other company offers. The Maclaren Triumph stands atop a mountain of umbrella strollers that have piled up in the market in recent years. The seat reclines back for napping babies, but also provides ample support and cushioning. We appreciate the lightweight aluminum frame, coming in at only 11 pounds. The fold is easy too, making it a breeze to throw in the back of the car as you head off to your next adventure.